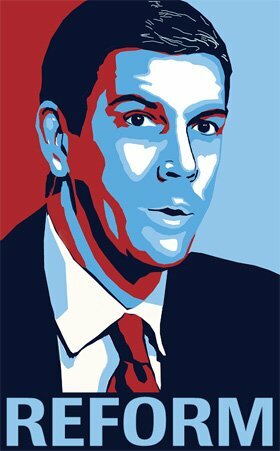 US Secretary of Education Arne Duncan today lamented that only a third of Joplin, Missouri was leveled by tornadoes. "Unfortunately, the fact that so much of the city remains standing will not enable us the opportunity to accomplish what we did in New Orleans." said Duncan. Duncan pointed to the proliferation of charter schools in New Orleans, and called the Joplin tornadoes, "a potential game-changer." Duncan suggested that education was a pressing crisis, and that we simply could not wait for natural disasters any more. "Let's just bulldoze the entire country from coast to coast," suggested the secretary. "Then, we could build an education system that could pretty much do whatever we wanted to." When confronted with the enormity of such a project, Duncan said he was open to compromise, and suggested that perhaps we could focus primarily on poorer neighborhoods. "Actually, most of my friends use private schools anyway," said Duncan. "The President sends his kids to private schools. So why waste our energy on areas that use private schools?" A source close to Duncan suggested the possibility of a smart bomb that would target only those making $200,000 or less, or $250,000 for joint returns. "That would really get those scores up, and we wouldn't have those darn nay-sayers blaming poverty anymore." suggested the source, under conditions of anonymity. Teacher groups strenuously objected to this scenario, but were roundly dismissed by those we interviewed. "What do teachers know about education?" asked former NYC Schools Chancellor Joel Klein. "They're agents of the status quo," suggested educational expert Bill Gates. These sentiments were immediately endorsed by Democrats for Educational Reform and Educators4Excellence. Oprah Winfrey invited Klein, Gates, and Michelle Rhee to an education roundtable on her new network to discuss Duncan's revolutionary proposal. President Barack Obama said the proposal was worth looking into, and told teachers, "We won't do it to ya, we'll do it with ya." While NEA leaders pointed out they'd heard that promise before, they declined to withdraw endorsement of the President. New York Mayor Michael Bloomberg suggested the plan would only work if he were given the option to fire teachers whenever he felt like it. Chancellor Dennis Walcott pledged, "I will fire all those teachers as soon as possible, but I will never treat them with disrespect."